Zebra mussels are spreading to lakes and rivers in the Midwest. These small invasive mussels attach to hard surfaces in lakes and rivers killing native mussels, limiting recreational activities, clogging water supply pipes, and competing with larval fish for food. You can provide important help tracking their distribution in Minnesota by spending a few minutes monitoring the lake or river where you live without any specialized equipment. Early detection for zebra mussels is important in protecting your property and Minnesota's water resources. 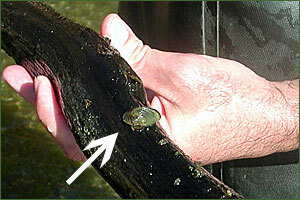 How can you monitor for zebra mussels?